Eight years later, how we get on remains uncertain to many of us, and when I visited Craig’s studio, our conversations embraced the more vulnerable, less rational pathways forward. 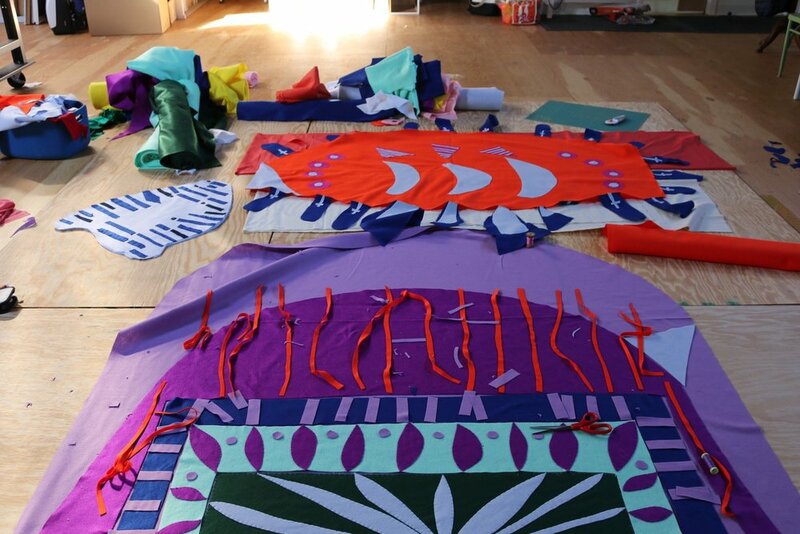 Craig’s brightly colored sewn felt works were a welcoming presence inside her large workspace. Fabric covered big parts of the floors and walls, buzzing under the bright fluorescent lighting. Craig’s newest works continue her investigation of soft materials, and many incorporate text—short phrases she thinks of as “affirmations.” One reads: “There’s still good in the world.” Within the context of our exchange, these words became more of an assertion than a statement, as if cutting out the letters and sewing them together fixed their meaning. Image courtesy of Megan Craig. Scattered about the room, I recognized many works I had previewed online that had been included in Craig’s solo show at Real Art Ways the previous year. The exhibition Shields began with a visual reference of the eponymous object. At the Yale University Art Gallery, Craig spotted a piece of horse armor found in Dura Europos (present-day Syria) dated to the second or third century A.D. The intricate iron armor was exquisitely crafted but impractical on account of its weight. The tension of this object—spiritually aloft yet saddled by its physical form—inspired a series of drawings: hundreds of black and white images based on metaphorical and literal shields. Craig explained that as the opening for Shields approached, more of her personal life entered the work than ever before. A close friend was diagnosed with cancer. Another faced deportation. Meanwhile, news coverage of the 2016 presidential election, the deaths of Prince and David Bowie, and several mass shootings contributed to her downcast mood. As Craig amassed her paper armor, a desire to protect her loved ones consumed her thoughts. She pondered the absurdity of these ornate, often heavy objects that simultaneously protect and label a person (or horse) as an object of war. Craig envisioned shields that were light, malleable. Soon, she started sewing. From her previous projects, Craig had experience sewing and a heap of leftover felt. Craig used this fabric—augmented by others mostly purchased at second-hand stores—to create a set of three capes, several tapestries, and a large installation, where viewers were invited to arrange the pieces of fabric to design their own shields. Craig hung dozens of drawings on one wall and she created a zine, but most of the works included in Shields were sewn, many of which directly encouraged public interaction. Megan Craig, Shields installation view at Real Art Ways, Hartford, CT. April - June 2018. Photographer: Stephanie Anestis. The Anti-Abduction Cape, Anti-Cancer Cape, and Anti-Deportation Cape were each made for an individual facing a specific type of danger. Craig’s friend, Nelly, who is still being monitored by ICE agents, learned about her cape at the opening, where she and others tried it on. Watching people gleefully embody the capes and flap their arms about in the massive swaddling of cloth brought levity to the heavier experiences that inspired them, Craig recalled. Wearing one of the capes also offered participants an opportunity to seek another form of shelter. The capes corresponded with wall tapestries made with similar colors and imagery. Standing inside the cape in front of its corresponding tapestry was an additional level of cover, underscoring the relationship between context and visibility. In the wrong environment, camouflage performs the inverse of its objective. Megan Craig’s studio, January 2019. Back inside Craig’s studio, I tried on the Anti-Deportation Cape. The maroon cape was large, and the weight of the felt was heavy on my body as I raised my arms. A large golden cross inside an orange and yellow sun covered the front of my body. The imagery and shape of the garment felt liturgical, and my mind wandered to places where I had seen similar robes: church ceremonies and graduation events, in particular. As a material, felt can feel crafty, but inside Craig’s cape, this connotation was swapped for the aura of regalia, the slow pace of each unhurried a sharp contrast to the speed of my life. In that moment, I wished I gave more of my time to simpler and singular tasks like sensing the folds of fabric on my body. The capes—almost comic in appearance with their saturated colors and symbolic imagery—convey safekeeping. Their gesture is protective and fanciful. In Craig’s essay for the show, she addresses the limits of shields, both hers and others. In the end, all shields fail because our bodies are vulnerable. But there’s another goal at hand: “... this work envisions an environment where escape, security, and recovery remain possible and celebratory, even if our lines of defense are as tenuous as thread” . This final thought brought me back to “Cora’s World,” where Craig balks at a distinction often made between the frivolity of play and the gravity of thought. Inside Craig’s cape, I returned to my childhood and understood how this playful costume helps enact a grave need to protect others. Inside the Anti-Deportation Cape at Megan Craig’s Studio, January 2019. Craig, Megan. “Cora’s World.” American Philosophical Association Newsletter on Feminism and Philosophy, Newsletter on Feminism and Philosophy. Vol. 10, no. 2, Spring 2011. Craig, Megan. Shields Exhibition Essay, April 2018.